Vancouver Mom > Holiday > The Vancouver Christmas Market is open! The Vancouver Christmas Market is open! You know it’s really the Christmas season when your toes are freezing, but it’s okay because you’ve got a mug of hot glühwein in your hands. The Vancouver Christmas Market opens tonight! 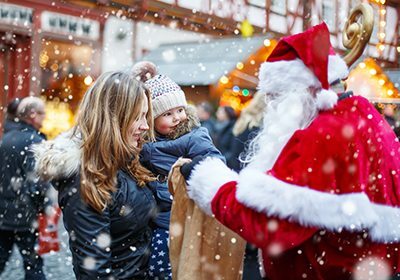 Returning to its spacious new-ish home at Jack Poole Plaza, the market has extended hours, a foodie-friendly array of scrumptious delights, a roaming glühwein man (or woman), live entertainment and a whole slew of new ‘lovely’ attractions. New this year is Lovers’ Lane, an Instagram-worthy, 20-foot long tunnel adorned with 10,000 twinkling lights and mistletoe (can you say date night?). There’s also a Love Lock Installation near the tunnel where lovers can seal their a love; a sleek new WunderBAR, providing an exclusive VIP experience with fancy cocktails in a gorgeous, heated wintery setting; a Winterdeck featuring stunning views of the North Shore. Remember to go with an empty stomach. With more that 80 food huts. there’s more that just bratwurst, pretzels and and schnitizel. Firstly, there glorious glühwein – the best mulled wine you’ll ever taste (NEW: a roaming glühwein man pours hot glasses from his backpack!) and all kinds of other fun things to nibble on: Swedish mini pancakes, waffles, traditional German dumplings, Scottish shortbread, and Mandelhaus roasted almonds, racelette, vegan and meat gulasch, berliners and more more more! PS: Check out foodie Tuesdays for $4 plates! The Christmas ornament options at the Market are always impressive. But be sure to take a walk through the Käthe Wohlfahrt tent to take a look at some intricate and mesmerizing traditional German ornaments and decor. The enchanting carousel is back, and you’ll be able to catch choirs (and fun bands) performing regularly on the stage in the middle of the market. And if that’s not enough, the 4Cats craft set takes place in a charming igloo – covered with adorable penguins. And of course. Santa will also be on-hand to charm the children and smile for the traditional Christmas photo. Parking can be expensive and a bit of a production so plan to take your time and transit is your best friend. You can take your stroller into the market, but at peak times, it can get crowded. While almost everything is outside, there are now lots of covered eating areas. Still, dress warmly and pack an umbrella! Most food sold at the Market is very walk-and-eat friendly though: waffles on a stick, sausages in buns, that kind of thing. If you book your tickets online, you can turn them into a season’s pass for free. Weekday lunch hours can be very busy, as everyone from the surrounding offices comes down to eat, but weekday afternoons are nice and calm. Special Kids Days, Date Night, Foodie Days and more! Previous Post Nine must-see holiday performances for families and kids! Nine must-see holiday performances for families and kids!